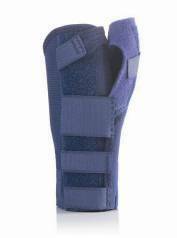 Actimove® Gauntlet is a functional thumb and wrist support for the treatment of light to moderate injuries or chronic instability problems at the thumb. Available in Small, Medium and Large. This product is for the left hand.